Hi there to you all. Thanks to the admin for getting me onto your site. I hope I am posting in the right section, cause we have a Lister Petter lpa2 air cooled 2 cylinder engine and I would like your thoughts on an issue we are having with the two injection pumps. Since we bought the machine, she is a bit hard to start when cold.When she was bought, the previous owner didn't wire up the cold start device.This was duly done, but she was still not great. We then decided to install a thermostart device with the fuel supply taken from the leak off circuit.Still not great to be honest but no problems when warm or even if she was switched off for an hour or so.Then one day she would start, but would not stay running so I took off the air intake pipe and she stayed running then (could be pure coincidence).The same thing happened again recently but this time no improvement. We took out the injector pumps to check them and it was found that both were faulty. We purchased two new ones but they just will not work when installed despite turning them every which way.They would pump away when hand pumping them with some fuel rigged up, but nothing when installed.Only one injector worked at first, but then nether worked then. We finally bit the bullet and took of the gear cover behind the crank pulley and she seems not to be advancing the governor, but retarded it ok and the rack that controls the pumps somehow.The large spring which I think is for the throttle was slack.We tightened this up by moving the little pin on the throttle linkage to one of the other positions ( maybe wrong to do so) but now this spring is better tightened up, and installed the two pumps again and made sure they were being operated by the governor.Now both injector pumps are working plus injectors.We cant put the engine back together again because some fuel pipes and gaskets have to be replaced but when thats done hopefully she will work again after some real head scratching was done.By the way the new advance/retard lever on the new pumps are more stiffer than the old ones. What I would like to know is what is the correct way these pumps should be removed and installed to avoid disturbing the settings on the pump and govenor, thanks and sorry about the long winded question. regards, James. Finally got her going but it was all a bit of a heartache.The setup is not so good. You are not alone in struggling with that engine model... Lister only produced it a couple years before going to water-cooled. The governor and fuel rack assembly can be a real pain and is mostly completely hidden inside the block so must be assembled largely by "feel". If you are not experienced with it, can be a real challenge. Thank you, I don't know what the correct procedure is. It would help greatly if they put an inspection plate that you can easily take off over the governor mechanism only, to check that everything lines up with the fuel pump rack instead of going to the trouble of removing a pulley and seven bolts on a cover. I still had some issues with the engine. After I put everything back she just would not start despite trying everything, but was running before. I then removed the drive belt and the crank pulley plus the hydraulic pump. I then decided to try to start her then,and to my surprise,she fired up. So.,I decided to put everything back again except the pump,and she started again. So this all means that I am guessing that what was the issue was she was trying to start while under load and trying to operate the hydraulics. On another issue how are these engines supposed to breathe? I don't know what machinery is attached to your engine, but there needs to be some sort of unloading valve to allow for easy starting - especially when cold. I have seen many of these used on portable welders and they often require a pretty substantial pre-heat to start up without a considerable amount of cranking. They have available optional DC preheating elements that fit into the inlet manifold for this purpose. Not certain of your meaning... there are at least three somewhat related things happening regarding air pressures and flows: 1.) combustion air and exhaust. 2.) cooling air flow and exhaust. 3.) crankcase pressure/vacuum and venting. #1. Make sure your rings and valves are in good condition and that the air filter is clean... these engines are known for weak valve trains and they often damage rocker arms and push rods. They also use hydraulic tappets (cam followers) that require careful attention regarding clean lube oil and manual compression to relieve air once disturbed or otherwise serviced. #2 These models rely on an axial cooling fan assembly that is belt driven. They are known for failing ball-bearings which can increase belt wear and cause belt failures = subsequent overheating. The fan can lose its efficiency due to dirt and dust build up. They must be kept fairly clean to avoid cooling related issues. You MUST pay close attention to belt maintenance or face engine overheating issues. #3 The crankcase should run a slight vacuum if the rings and valves are in good condition and properly adjusted. 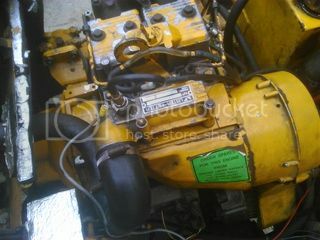 Thanks for the replys, the engine is in a benford 1.5 tonne dumper. She had an inlet manifold heater that was not wired up to it by the previous owner. I changed the OE unit with a thermostart unit which has a flame coming from it for a few minutes which is working fine. I just was wondering how the crankcase is vented as all engines need that,don't they? In other engines there is a hose that is connected from the engine to the air cleaner. How do these engines do this task,that was my question, cheers. P.S when you say unloading valve,do you mean on the engine,or the equipment it's attached to? We are not too familiar with Benfords here... but we were talking of the hydraulic system in general. There should not be any load/pressure from the pump during startup/warmup. Lister uses an internal vent into the inlet manifolds to create the crankcase vacuum. Yeah,"Benfords"are a British built machine. I would take a guess that the operating lever that lowers or raises the bin was in the raised position and so the hydraulic pump was putting a load on the engine while starting,and I just didn't notice it. While starting, I have to apply force to the hand crank after I get up to speed. Tom told me to lean DOWN on the starting handle to build speed, and save strength for the pull up, when the decompress is disengaged. Mine fires on the first compression at 35F. Below that, I have to crank through 1 more compression when it's really cold. Parasitic loads (the belt to the generator or whatever) can add enough drag, that you can't build up enough speed, and thick oil in the crankcase can also slow it down. We used to have a single cylinder "Petter" dumper engine that was a manual start which you would have to have the "knack" when starting from cold, but easier when warm.This present engine is electric start though. HI again, is 22 and 28 bar compression pressure enough for ignition to occur on this engine? The pushrod tube seals on the head side was leaking and I removed the pushrods to try to seal them up instead of removing the head,which it seems to have done. Compression was checked before and after removal,and it is generally the same on both checks. She seems to be a right bugger to start when cold,even worse now. There is black smoke while cranking,but still not firing. She will at times start in the evenings sometimes,but more often than not she won't and always with heat. How good should the lpa2/3 engine be at starting from cold? Where abouts are you located in the UK, as I know of a couple of retired Lister Petter service engineers that are very familiar with the LPA/LPW range of engines, and may be able to help you out. In a prevoius job I worked with Benford Equipment, and as I was leaving the LPA2 equipped Benford dumpers were just been introduced, never had much to do with them, other than routine servicing, at the time they seemed like very good cold starting engine. From the compression pressure figures that you have quoted, that should be more than enough to get a easy cold start. Also poor condition of the fuel injection equipment will have the effects you describe, have you observed the spray pattern of the injectors out of the engine, ie turn the engine over with the injectors out of the engine but still connected to the engine fuel pumps. It is an unfortunate aspect of the fuel pump design on these engines that they cannot be reconditioned, because the fuel pump body forms the element of the pump, so you will require a complete new pump if it has wear on the plunger or the bore which it runs in. Hi, thanks for the reply.Yes I have got the injectors tested and they are spraying in a cross pattern.The old injection pumps were kaput, even though the engine was running, but the linkage that is operated was very free to move over and back.This linkage on the new ones are more stiffer.The shims underneath were just put back as was, but how can you remove them without taking off the pumps? Yes I was told that some of them pumps can be reconditioned and others cannot.The fact that there is black smoke while cranking would suggest that there is enough fuel been injected.Since the pushrods were removed, she has gotten worse though cold start was not good, but I cant see how this has any bearing on it since the compression is the same as it was before removal. By the way, I am in Ireland. I checked the compression pressures and they are still roughly the same.I turned over the engine with the injectors removed and while I was standing up, one cylinder nearly blew my face off, and the other not so good.But, here is the confusing part, the cylinder that had slightly lower pressure was the one that had a lot of air coming out, and the other one which had higher pressure was not as strong. How can that be? She did seem to start a little better afterwards though.Could the cylinders be "flooding"? It would seem like it, but I dont know.